Training in Mindful Eating can help frequent restaurant-goers prevent weight gain, according to a recent study of 35 healthy women aged 40-59 who dined out an average of six times a week. Although the intervention was aimed solely at weight maintenance and not weight gain, participants in the study lost an average of nearly four pounds over six weeks, without cutting back on the number of visits to restaurants. 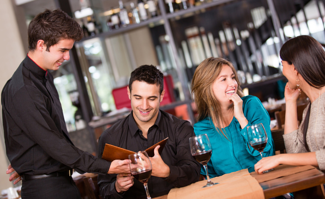 When you go out to eat at a restaurant, you’re usually there because you want to enjoy yourself. For many people, it’s an important part of their on-the-go lifestyle and social life — even with the economic downturn. A recent study of 35 healthy women aged 40-59 who eat out frequently focused on both limiting portions and maximizing the enjoyment of food. Even though the study was aimed solely on weight management and not weight loss, members of the group lost significantly more weight than the control group. They also consumed significantly fewer calories and less fat without cutting back on the number of visits to restaurants, according to results published in the January-February issue of the Journal of Nutrition Education and Behavior. So how can you keep the pleasurable component of dining out, and at the same time, reduce or minimize the amount of food you’re eating? How can you thoroughly enjoy and get pleasure out of your food – and yet be aware of how your body is feeling and when you are full? The study included the usual basic knowledge-building about healthy alternatives and portion sizes, but another key component is one often overlooked – the importance of mindfulness or awareness when eating. Over the study’s six weeks, the women were led through mindful eating meditations, which helped the women relax and savor their food by noticing the smell, texture and taste of the food. The women also learned how to pause and notice how full or satisfied they were before eating more. I think of mindful eating as the third leg of a three-legged stool – the missing component that diet and exercise need to maximize your ability to create the relationship you want with food and with your body. When I began a regular practice of Mindful Eating several years ago, I felt like I had discovered a “secret weapon” – I began to notice that when I ate mindfully, I usually ended up consuming about half the amount of food I thought I would need to feel satisfied. But the best part is how much more pure enjoyment I now get from food that is eaten mindfully – and how much more satiated and satisfied I am when I eat mindfully. And because I really taste the food, I’ve become a “pickier” eater – I’m less willing to eat food that doesn’t taste good. More good news: I’ve also found that you don’t have to eat each and every bite mindfully to change your experience of the meal. Just a few bites eaten with awareness can help you get in touch with your level of hunger before you take the next bite. Mindful Eating is just another benefit that I’ve been delighted to discover from meditating in general: this relaxed, fully present ‘here and now’ mindset is available in many everyday activities of life, including eating. Written by: Dr. Jan Anderson. Read more. For Dr. Jan Anderson's track on Mindful Eating, click here.